The welcome sign to Zikhron Ya’akov is on an oversize barrel of wine—a reminder of the town’s beginnings and a hint of good things to come. Everything about Zikhron Ya’akov spells romance. In this town that some call simply Zikhron and others call the Provence of Israel, the view, the shops, the restaurants and the wineries tempt all the senses. a Visitors can spend hours exploring the tree-lined pedestrian mall called the Wine Road, on Hameyasdim (founders) Street. There, the 19th-century, red-roofed houses have become boutiques and cafés, with courtyards filled with more shops, craft centers and restaurants. And those are just the pleasures of the flesh. This hilltop town, 20 miles south of Haifa and overlooking the Mediterranean Sea, has a rich history that includes the resolve of its founders, the patronage of a baron and the heroism of a young woman. In 1882, a group of religious Jews from Romania arrived in Palestine eager to settle the land. They bought a site on the southern spur of Mount Carmel and adopted the Arab name, Zammarin, thinking it was a corruption of Samaria. Ill-prepared, ill-equipped and harassed by Ottoman officials, these First Aliyah settlers nearly starved. Even worse were the diseases: malaria, dysentery and trachoma. The first year, one out of 10 died. The following year, Baron Edmond de Rothschild started investing in the village, introducing grapes and a wine cellar and renaming it Zikhron Ya’akov after his father, James. The baron saved the 328 souls, but his patronage made them totally dependent on him. The farmers achieved independence and began to prosper in 1903, when the Jewish Colonization Association gave them lands suitable for cash crops. In 1906, botanist and agronomist Aaron Aaronsohn, son of a prominent founding family, became famous for his discovery in Rosh Pina of what he called the “mother” of all wheat—the original strain that yielded emmer wheat, which had been planted in Israel since biblical times. With the support of American Jews, including Henrietta Szold, he founded Palestine’s first experimental agricultural station in nearby Atlit. In 1912, the European farmers were joined by immigrants from Yemen who believed that the coming of the Messiah was imminent. In 1913, a group of teenage boys headed by Alexander Aaronsohn, Aaron’s brother, founded the Gidonim, the first youth movement in Eretz Yisrael; they were named after the men the biblical Gideon picked to fight against the Midianites. They made improvements in the village and guarded it. They even tried to establish a farming community in nearby Shuni, but disbanded a year later after some of them were drafted into the Turkish Army and others left the country. The most famous event in Zikhron Ya’akov was the creation of NILI, a spy ring of Jews who aimed to oust the Turks from Palestine and install the British in their place. NILI was founded by Aaron Aaronsohn, his assistant Avshalom Feinberg and Aaronsohn’s sister Sarah. Aaronsohn, whose work in 1915 to eradicate a plague of locusts enabled him and his assistants to travel freely, collected military, political and economic information. In 1917, the Turks discovered NILI, and Sarah was arrested and tortured. Fearing that she would divulge information, she shot herself and died four days later. The extent of NILI’s contribution to British intelligence has always been debated. Only in 1967 were the NILI members adopted into the national pantheon, and Sarah Aaronsohn became a role model for Israeli children. In the 1930s and 1940s, Zikhron Ya’akov became a resort town where the lively cafés doubled as dance halls favored by the British. In the 1950s, an influx of immigrants swelled the population. Today, the town is growing again as developers cover the hills with apartment buildings. Family businesses, many owned by founders’ descendents, are among Zikhron Ya’akov’s attractions. The varied population of 18,000 also includes descendents of the early Yemenite immigrants. Recently, the town has seen a surge of English-speaking immigrants, and local residents have established Yad Ezer, an information service for them (www.zy1882.co.il/eng). Yad Ezer also helps needy families with medical care, food and clothing. Another group is Kibbutz Beit El, 450 German Christian Zionists who live communally. Since their arrival in the 1960s, they have built seven factories, including one that manufactures air-filtration systems to defend against nonconventional weapons. The group is the town’s second-largest employer. Take the train from either Haifa or Tel Aviv and get off at Binyamina. Bus No. 70 will bring you to the stop opposite the tourist information center of the Gidonim, an association that promotes local tourism and preservation and is named for the early youth movement. Arrange all tours, including museum tours, in advance (Hameyasdim Street; 011-972-4-639-8811; gidonim@bezeqint.net). Many of the town’s sights are on Hameyasdim or just off it. The next building on the right is Yad Lameyasdim (972-4-639-8811), a memorial to the founders, which has photographs and objects showing the way of life in the early years. The painting on the door is based on an early photograph of the village. Among the exhibits is a Torah scroll, one of two that the early settlers pawned for food. A picture dated 1895, however, shows a bustling community dubbed Little Paris. The memorial is in the former granary, a symbol of the farmers’ economic independence. The round white building now resembles a Torah scroll, the open end of which is adorned by a ceramic frieze with figures and names of the founders. Cross Hameyasdim to reach Hagranot Road and the entrance to the cemetery. Dozens of graves of infants and children bear silent testimony to the hardships of the early years. No names appear on the graves of infants who died when they were less than a week old. In another section, a green metal fence surrounds the graves of Sarah Aaronsohn and her mother, Malka. Near the cemetery entrance is a memorial plaque for Sarah’s brother Aaron, who died in a plane crash in 1919. Return to Hameyasdim and continue north, passing through the town gate. On the right is the green-painted water tower with a portrait of the baron. At the intersection of Hameyasdim and NILI Boulevard, the Aaronsohn family compound is on the right, with three sites for visitors to explore. The only changes to their first, 19th-century home—painted its original rose color—have been an update of the kitchen and the addition of electricity. The heavy, dark furniture is from Romania, but wall hangings and carpets are from the East. Next door is the home of Aaron Aaronsohn, with inlaid furniture from Damascus and many of his books. Some of the furnishings, like the bed on which Sarah lay dying, have wheat-motif carvings. A newer structure houses a museum that tells the story of NILI, pointing out that Sarah’s determination to oust the Turks was grounded in her horror at having witnessed the Armenian genocide in Turkey (40 Hameyasdim; 972-4-639-0120;www.nili-museum.org.il). Among the boutiques and crafts shops along the pedestrian mall is Antikon (54 Hameyasdim; 972-4-629-3015), crammed with Victorian-style jewelry, ornaments and tchotchkes. Another is Tut Neyar Paper Mill, where visitors can make their own paper from mulberry bark (39 Hameyasdim; 972-4-639-7631; www.tutneyar.co.il). At the intersection of Hanadiv Street, turn left to see Ohel Yaakov, the town’s oldest synagogue, dedicated in 1886 and named for Baron de Rothschild’s father. The builders were German Templers from Haifa. A clock with Hebrew letters instead of numbers sits high on the pink-stucco façade. The stucco obscures the original stone, which is visible only in the pointed arches over the entrances and windows. A plethora of stars shine from the dark blue ceiling of the basilica-like interior. According to synagogue manager Meir Mayunka, in the old days, men and women entered through a single door and the Torah was read near the Ark. Later, separate entrances for men and women were created and the bima was moved to the center. Four times a year, a memorial service is held for the baron and baroness, Adelaide de Rothschild. The rite is Ashkenazic (for English-language tours, contact Gershon Coren, 972-54-551-2197; www.ohelyaakov.com). 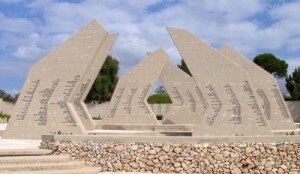 Next door at 2 Hanadiv is the First Aliyah Museum (972-4-629-4777; oramuseumzy@bezeqint.net). Settlers’ stories are told through the experiences of a single family. This must-see museum—housed in the restored administration building that served the baron’s staff, the grandest house in Eretz Yisrael in its time—gives the First Aliyah immigrants their rightful place in history. For a green break, cross the street from the museum to the shady Promenade Garden, which was planted between 1886 and 1888. The first park in Eretz Yisrael, it was once much larger than it is today. A recent spruce-up included restoration of the fishpond. Exit the park and turn right on Herzl Street, then turn left on Habroshim—a narrow lane of cypresses. At the end of Habroshim, another narrow lane leads left and right to the Lange estate, the stately home built between 1912 and 1914 by Nita and Michael Lange, the “lovers” of Zikhron. Nita was the daughter of Herbert Bentwich, the baron’s lawyer and an ardent Zionist. Henrietta Szold was among their many visitors. Nita died suddenly in 1922, apparently of appendicitis, and her husband killed himself soon after. The couple had no children and their estate went to Nita’s widowed sister, Lilian. She established a vacation home for musicians and named it Beth Daniel, after her son. The building now belongs to the Open University (972-4-639-9001); currently the house is not open for tours. The German Kibbutz Beit El is nearby. Return to Hanadiv and take the second left on Hayayin Street to reach Givat Zammarin, where the pioneers settled first. Today the buildings house a variety of boutiques. Now return to Hameyasdim and retrace your steps to the town gate and continue north, taking the second right onto Hashita Street to reach Shem Olam, the Holocaust memorial. A bronze-topped pillar in the shape of a Magen David stands at the entrance to the small park. 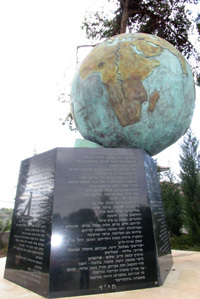 At the far end of a grassy space, a large bronze globe of the Earth perches on the edge of a hexagonal black granite plinth. On the plinth are inscribed the names of relatives of founders and residents who perished in the Holocaust. Return to the traffic circle and turn right on Aaron Road. After about one-third of a mile, a right turn on Shira Street leads to Beit Hatotchan, a memorial for the fallen members of Israel’s Artillery Corps. At the entrance to the memorial stands the terra cotta-colored home of Alexander Aaronsohn. During Israel’s War of Independence, the house served as a rest home for soldiers. Alexander’s sister Rivka later donated it and the land around it to the Defense Ministry. Items of artillery are displayed on the grounds. In a plaza overlooking the sea, six branch-like pillars bear the names of the 756 fallen. A memorial hall contains a paper album for each of the fallen and computers with access to digital files about them. Beit Nir, an auditorium faced in metal and stone, doubles as a concert and performance hall. It was donated by the family of Lt. Nir Shreibman, one of 73 soldiers who perished in a helicopter crash in 1997. Shreibman was also an American citizen whose family hails from La Vergne, Tennessee. Soldiers conduct the tours (972-4-639-6573; totchan@netvision.net.il). Beit Hatotchan. Photo by Esther Hecht. Return to Aaron Road and continue south, turning right opposite the Dor gas station to reach Ramat Hanadiv (972-4-629-8111; www.ramathanadiv.org.il). This beautiful reserve has a 1,125-acre park that contains trails for day hikes, archaeological finds and a year-round spring; 17 acres of landscaped gardens for easy strolling, with an amphitheater for summer concerts; a research center to aid in managing the area; and a restaurant. A visitors’ pavilion, designed by Ada Karmi-Melamede and artfully concealed behind an earthen bank, is the first Israeli building certified for adherence to green building standards. In 1954, the remains of Baron de Rothschild and his wife were reinterred in a mausoleum in the gardens. The Tishbi Winery (972-4-628-8195; www.tishbi.com) is just south of Ramat Hanadiv, on Aaron Road. Tishbi has excellent English-language wine-tasting tours during which visitors will also learn about Tishbi’s award-winning brandy. Tishbi’s founders came from Lithuania in 1882. Their descendents now produce one million bottles annually, 30 percent of them for export. A dairy breakfast and lunch are available even for those who don’t take the tour. Prebooked wine tours are also offered at the Carmel Winery, which has a new wine culture center (Derech Hayekev; 972-4-639-1788; www.carmelwines.co.il). This winery, built in 1882 by Baron de Rothschild, is one of Israel’s two largest. In 1891, as part of the wine-producing enterprise in Zikhron Ya’akov, the baron built a bottle factory on Dor Beach, about three miles northwest of the village, but it was abandoned in 1896. The building, now part of Kibbutz Nahsholim, houses Hamizgaga (972-4-639-0950; www.mizgaga.com), the Underwater Archaeological Museum, with finds from the sea covering 4,000 years of history. The NILI story has inspired a slew of books, including The Aaronsohn Saga (Gefen) by Shmuel Katz. Hillel Halkin, writer, translator and commentator, is a longtime Zikhron Ya’akov resident whose book A Strange Death (Public Affairs) spans nine decades in the community, starting with the NILI saga, and has a murder mystery at its heart. Sarah, Giborat NILI (Sarah, heroine of NILI), a Hebrew novel for youngsters by Devorah Omer, sold more than 88,000 copies in Israel between 1970 and 2000. The English version is titled The Gideonites: The Story of the NILI Spies in the Middle East(Funk & Wagnalls). The NILI Spies (Routledge) by Anita Engle recounts the tragedy generated by the spy ring’s misunderstanding of British intentions. In Lawrence and Aaronsohn: T.E. Lawrence, Aaron Aaronsohn, and the Seeds of the Arab-Israeli Conflict (Penguin), Ronald Florence provides biographies of two key figures and portrays the early stages of Zionism and Palestinian nationalism. Ted Arison, shipping magnate, philanthropist and reportedly the world’s richest Jew before his death in 1999, was born in Zikhron Ya’akov, the grandson of founders. In the 1950s, he moved to the United States, where he made his fortune through shipping and the Carnival Cruise Line. He returned to Israel in 1990 and took part in the privatization of a large construction company (Shikun Ufituah) and Bank Hapoalim. Before becoming the first woman to head an Israeli university in 2005—when she was named president of Ben-Gurion University of the Negev—Zikhron Ya’akov-born Rivka Carmi was the first female dean of a faculty of health sciences in Israel, also at Ben-Gurion University. Physician Hillel Joffe, known for his struggle against malaria, lived in Zikhron Ya’akov and is buried there. Zikhron Ya’akov is an excellent base for visiting Caesarea, Dor Beach and Haifa. Plan a midweek visit to avoid the weekend crowds. Beit Maimon is a family-owned boutique hotel overlooking the sea. It has a pool, a spa and a terrace café with vine-covered trellises (4 Zahal; 972-4-629-0390; www.maimon.com). Casa Barone, on the premises, is a kosher Mediterranean restaurant (972-4-629-0999; www.casa-barone.co.il). For a midmorning break or lunch in a vintage setting, visit Mayunka’s bakery and café and meet its 80-year-old founder, Meir Mayunka. Be sure to taste the apple strudel (58 Hameyasdim; 972-4-639-9003). The Tishbi wine shop, café and restaurant, owned by the winery family, serves tasty food in a casual setting (33 Hameyasdim; 972-4-629-0280). At Hadubim, a bakery, café and restaurant, try the stuffed mushrooms and the apple strudel (50 Hameyasdim; 972-4-639-9604). In Ramat Hanadiv, Kerem Zeitim is a new dairy and fish restaurant that offers innovative Israeli cuisine with an incomparable view (972-4-629-8114). Cultural pleasures include Friday noon concerts in an informal setting by harpist Adina Haroz, who plays a variety of instruments. Prebook for English-speaking groups and other times (Inbalim Hall, 30 Hameyasdim; 972-4-639-2584;www.inbalim.co.il). 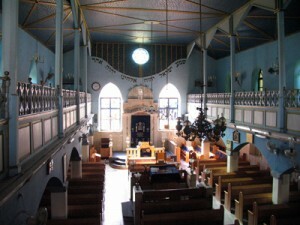 Zikhron Ya’akov has 32 synagogues. Most are Orthodox and 20 have at least one daily minyan. Ve’ahavta is Conservative (2 Hashmura; 972-4-629-1180; veahavta@netvision .net.il). Kehillat Sulam Ya’akov is Reform (Beit Hatotchan Road, behind the Matnas Music Center; 972-4-629-3113; sulam@bezeqint.net). Having satisfied both body and soul, relax in a café on the pedestrian mall and soak up the ambience as smiling visitors stroll by.